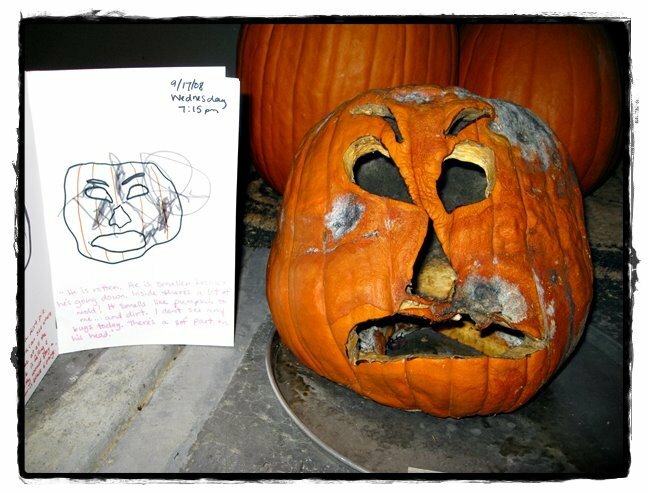 What happens to a rotting pumpkin? 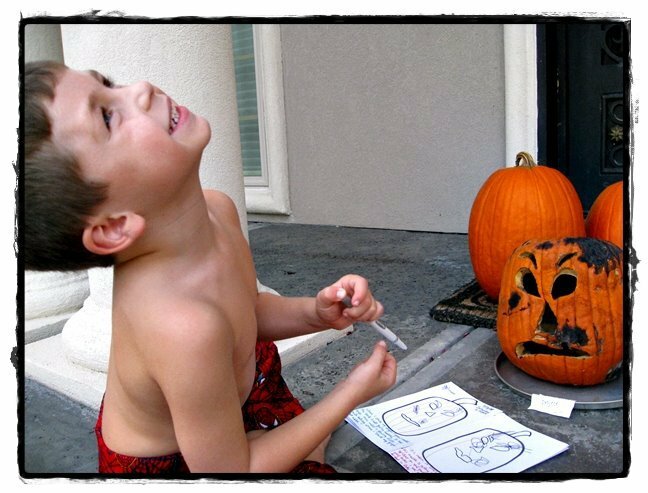 You are here: Home / Fun Activities For Kids (By Age) / Activities For Elementary School Kids / What happens to a rotting pumpkin? 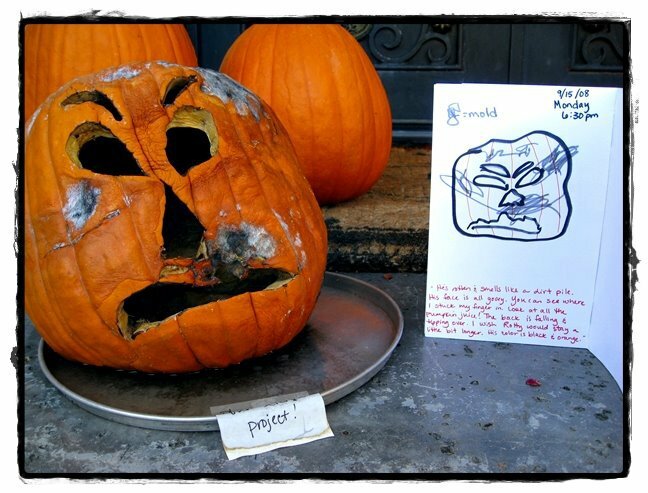 What happens when you let a pumpkin rot? That was the question proposed by my son last year…so we decided to find out. 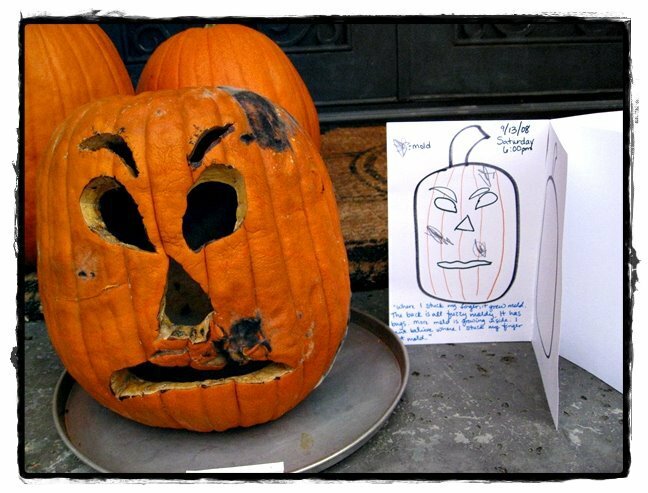 We carved our pumpkin & put it on the porch to greet visitors. 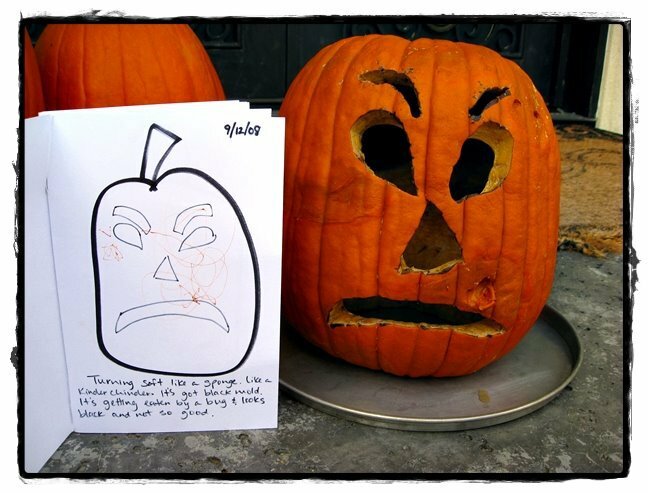 After a few weeks, our pumpkin, who Reese named Jack Rotty, began to get a little mushy. We got a tray for Rotty to sit on so he wouldn’t rot directly onto the porch. We made a journal to record our daily findings. We got to work! Reese poked his finger into the mushy parts…. Each day, Mom recorded Reese’s observations. I drew the outline of Rotty & Reese colored in the mold spots & mushy parts. 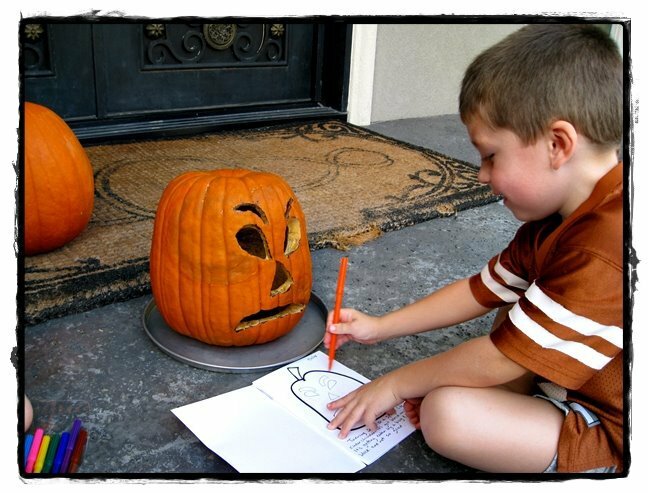 If you have an older child, let them do the recording & drawing. We loved watching how the face of Rotty got grumpier and grumpier as it aged. This was a GREAT experiment to do together. It was Reese’s first chance at long term observation, and our record book helped keep track of the changes each time we looked. I had to put a note on Rotty that said “Please excuse our science experiment!” because I was afraid our dear UPS lady would think we’re nuts! This is GREAT! I think I remember seeing it last year when ya’ll did it; but this is so detailed and great pirctures! In fact, I was laughing my head off as I scrolled down. GROOOOSSSSSSS! But so hilarious; and such a great project. I love love love it. We are TOTALLY doing it this year. Jack (8) will go CRAZY for this!! I love his pictures! Journaling is such a great idea! Love that you turned something that is normally a ‘groan task’ (i.e. 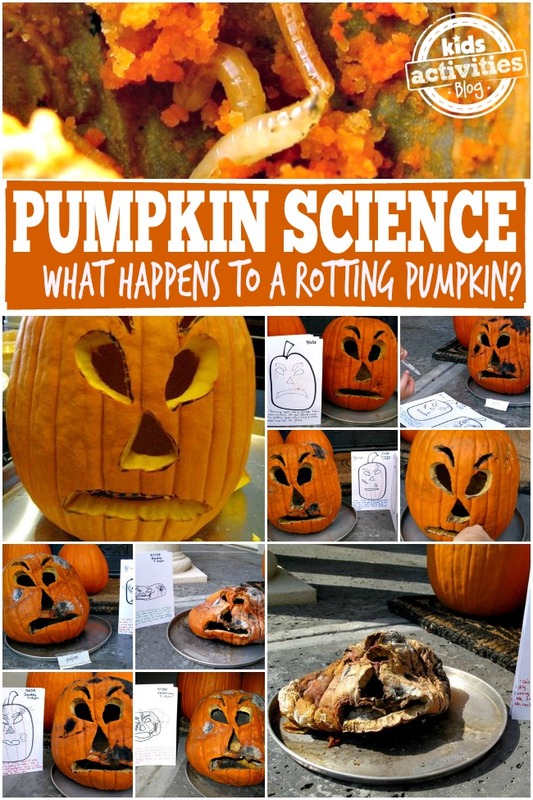 who gets to throw out the rotting pumpkin) and turned it into a science project! So cool! Great project, I may have to try this with my step grandson, who is 10. I’ll have to find out what they are doing in Science. 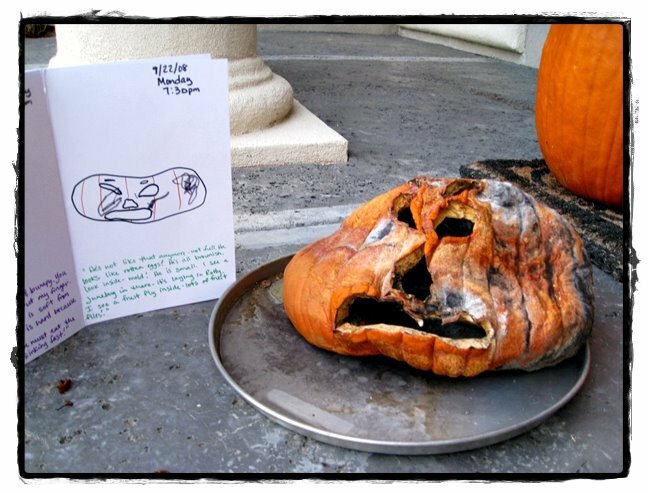 I can’t help but think of you every time I see a rotting pumpkin…in a nice way :). This is BRILLIANT! I loved reading Reese’s observations and can’t wait to try this with my kids when they’re a it older. This is fantastic! I love seeing the progression. And it’s so disgusting at the same time! You’ll have to let us know how it goes! I loved your extension idea! We will be doing it that way this year! my three year old class observed our pumpkin from (2010) decompose, then germinate in the spring (2011), to produce our halloween pumpkin! They used powerful words to describe the process….gross, disgusting, ugly, shrinking, moldy, hairy, germinate, flower, vine, tendril. The pumpkin is about ready to harvest, a life cycle completed! That is amazing! What a unique, meaningful experience you gave them. I guarantee they will remember much more about pumpkins & their growing cycle than if you had just read a book & done a cut-and-paste! And talk about learning dealyed gratification! What a great, but simple idea! Poor Rotty. Thank you so much for linking up to Fun Sparks. Loved your experiment and logging of the process. 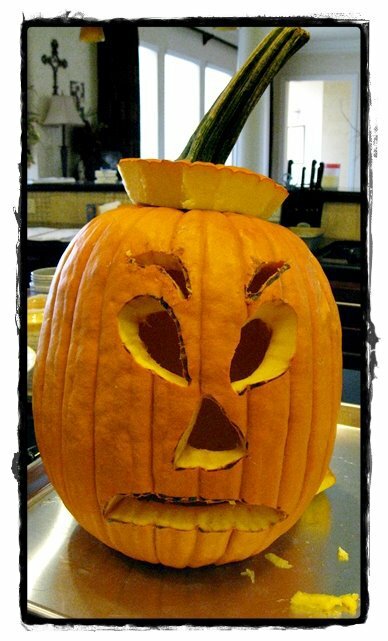 This is what happened when someone left a pumpkin to rot at my house. What a great surprise. Fall is fun isn’t it? 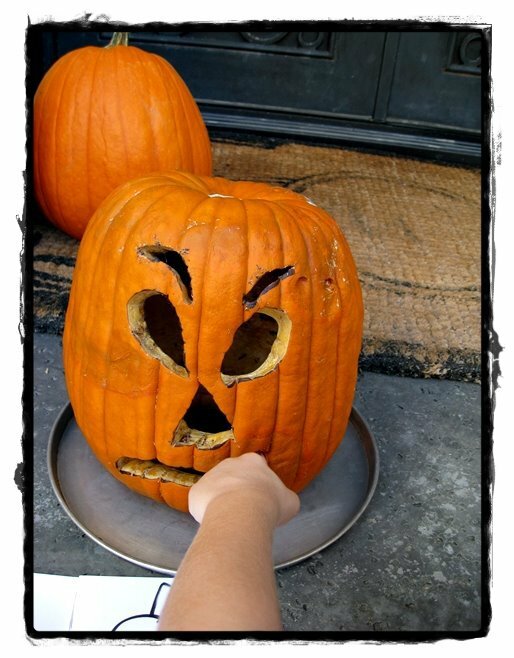 Big M threw Little M’s pumpkin… it broke (of course). After handing out the appropriate consequences I decided this pumpkin would NOT go to waste. We are on day three of our pumpkin experiment. It’s in a container and we just cut off the top of the pumpkin. The seeds are still in… I can’t wait to see what they think of the results. I have been taking pictures and writing in our family science journal. Having them keep their own picture records is a great idea. I think we’ll start that tomorrow! fabulous photos of your experiment. I want to do this with my girls this year. They have been begging to see what happens to the pumpkin. 😀 This is great! So educational! When I was a Girl Scout leader, we did an experiment comparing different hand cleaning methods in which the girls handled apples and then we looked at them a week later. We wound up extending the observations for 2 more weeks because they were so interested in the development of the mold! That was the creepiest Halloween story so far! Great journaling! already did that did the same exact exmirement BRO!!!!!!!!!!!!! 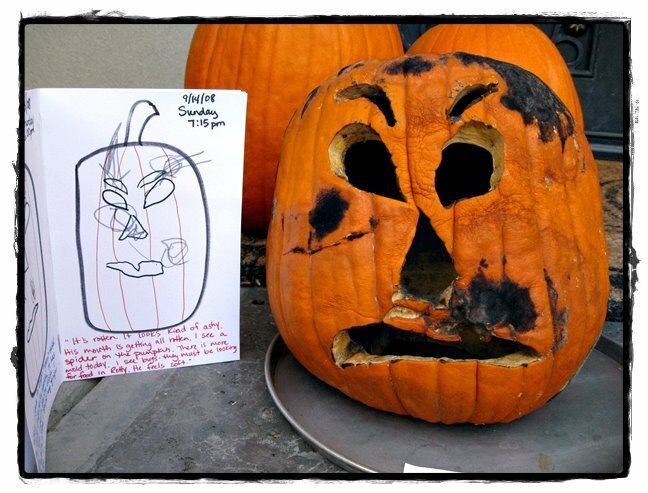 That is awesome–the story of Pumpkin Jack in real life!